The Negative Confession that is in the Papyrus of Ani, is often referred to as the “42 Laws of Ma’at”. While this part of the Pert Em Hrw or Book of Coming Forth by Day (aka the Ancient Egyptian Book of the Dead) Spell or Chapter 125. Though it is a moral ideal in ancient Kemetic culture, it is erroneous to consider that these are “Laws” in the way that our written rules of law or even the Ten Commandments that YHWH gave to Moses. The 42 points of the Negative Confession serve as a way that your heart will not, in essence, “rat you out” to Anubis when it is weighed against the ostrich feather of Ma’at. 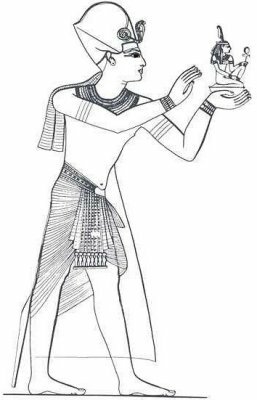 If it is found heavier than the feather, then ultimately, your heart will be fed to the Ammit. This is the ever-dreaded “Second Death” that is spoken of in ancient Egyptian literature. If one suffers the Second Death, then it is as if you never were. To the ancient Kemetic people, that was a fate far worse than even the First Death. This is, I firmly believe, the core of what Ma’at is, and who we as Kemetics are. Dr. Karanga’s definition cuts to the heart of what most of us look for in our spiritual and day to day practices. This leaves we in the Kemetic Community as well as those outside of it to examine on a nearly constant basis what it is we are doing, why we are doing it and how it effects the greater whole. I cannot believe that we as human beings are so self-involved, greedy or thoughtless as to not for the mostpart be concerned about these things. Careful consideration of Ma’at and what Ma’at represents or is enacted is something that is an obligation that we have to ourselves and to our world. The profundity of free will and conscious consideration toward a set of ideals that is represented in Ma’at and the symbolism behind both the Goddess and the ideal that accompanies her cannot be understated. This is what almost every piece of liturgical text and piece of wisdom literature focuses upon and it is the cornerstone of our respective Faiths. This is something that is very important, I believe, and in order for us to move forward if our vision of a viable, strong Kemetic community, we need to have dialogue about it. I know that we can do it. I fully expect that such a vision will come to pass and that each of us will strive in accordance as closely as possible with Ma’at. I am therefore inviting the membership of the Kemetic Community and those outside of it to consider the negative confession, the ideals that it represents and how we can further that in re-establishing them for ourselves and as a community and fellow inhabitants of this world. Comments can be left here or you may email me directly at maatpublishing at gmail dot com. I asked myself, *is this any way for me to behave? Is this how a servant of the Lady of Light should conduct herself? * The answer is, of course, NO. So I splashed my face with water, went out determined to have a good time and, whaddya know, it was a terrific dinner, even in the middle of the noise, chaos, and dark. Whenever I’m depressed, or feeling angry, or wishing I could be something I’m not, I try to remember a corresponding Confession. (“I do not dislike myself.”–a KO translation, BTW–, “I have not been hot-tempered.”, “I have not transgressed my nature.”) The Forty-Two Purifications are a set of guidelines echoed in all the Didactic Literature that help us live in a way that makes us less miserable and helps prevent us from unduly making others miserable. I wrote two posts about living in Maat that are based off Jan Assman’s work. I can link you to them if you want. I do believe these are things we need to discuss. We as Kemetics are not perfect. We certainly fall short of the ideal- and we would be lying to ourselves if we in any way thought that our ancient akhu were perfect on that count, either! I notice, however, that a great many within our community and in other places as well, there is a lot of lack of self esteem, or hatred of self on one level or another. If we start to address this, I do believe the natural progression is that we end up treating others better as well and the cycle continues to build from there. It is interesting to note that Jan Assman also wrote the foreword in Karenga’s book and it was very good as well. There’s a third installment about isfet and what happens when we live outside of Maat, but I haven’t felt like posting it. This weekend, maybe. I think there’s some hesitation in talking about ethics and morals because it is so, so, SO easy to become preachy. It’s not easy to talk about, either, because you do have to read a lot right now in order to really grasp Kemetic ethics and morals. Some day someone will have the courage and tone to write about it. I think Karenga’s book is a good start, but we always need more opinions. Jan Assman’s work in general is very good. Mind of Egypt is one of his best works, but it’s not one you read once. You come back to it again and again. As you change, so does your reading of the work. What you get out of it changes, too. I see your point. As opinionated as I am, I certainly don’t want to appear to be preachy – although anytime you bring up Ma’at, you sort of inevitably give that impression. As of late, I am getting back into my basics. Yes, I have my KO foundation, but I am going through my books, both good and not so good and really sitting down to consider what it is that *I* personally believe as a spiritual exercise. IMO, it is far too easy to parrot what we read or hear from others. I am also going through this blog, working with the categorizations, and the links and getting those sorted. Reblogged this on Your Pop Psychic.